iamsick.ca is a social enterprise with a laser focus on simplifying access to healthcare by helping Canadians find fast, easy, and appropriate care. Our website and mobile app allow patients to find nearby healthcare providers, book appointments online, see wait times from the comfort of their homes, and avoid long waits with our virtual waiting room. Healthcare providers also benefit from our platform, because we help them deliver care more efficiently. As we prepare for our next stage of growth, we are looking for a business development representative to join our team. If you think you’d be a good fit, we’d love to hear from you! In a nutshell, we are looking for an outgoing individual with some experience in sales & marketing who thrives in a startup environment. You will help us spread the good word about iamsick.ca to healthcare providers. You should be outcomes-oriented, and will be managing – and generally crushing – the sales pipeline. You are a go-getter who takes pride in your work and won’t settle for anything less than excellence. You relentlessly ensure the highest level of quality sales and service for our clients. Please submit your application by September 16 to careers[at]iamsick.ca. How can a Canadian digital health startup like iamsick.ca improve healthcare access for pregnant women living in rural parts of The Philippines? It isn’t surprising that remote areas of the world have limited access to healthcare. When it comes to maternal health, this means limited access to obstetricians and diagnostic services that you would see in larger metropolitan areas. In the Philippines, it can be as extreme as 44% of pregnant women giving birth without access to a doctor. Last Spring, we teamed up with another U of T startup, Sonola Imaging Technologies, whose specialty is creating portable ultrasound hardware, and prepared a Grand Challenges Canada proposal to build a maternal health ultrasound mHealth app & web platform. Nurses and midwives in remote satellite clinics will use Sonola’s portable ultrasound device and our android app to record ultrasound images. These images would then be easily accessed & viewed by physicians at major health centres in nearby cities. Last October, Grand Challenges Canada awarded us with a grant to support the project. So, while working on the iamsick.ca website and mobile apps to help Canadians navigate the healthcare system and book online appointments with their doctors, members of our team have been hard at work on this global health project. Our team is designing & developing the android app & web infrastructure, while Sonola is building the hardware that will be used to capture the ultrasound images. By working together, our two early-stage Canadian start-ups will create a system that will hopefully redefine maternal health access in rural parts of the Philippines. The ultimate goal of this project is to create a low-cost and scalable product. In contrast to traditional ultrasound machines, we are using readily available hardware, such as low- to mid-range Android phones and chip sets. In the future, this system could eventually be used to monitor pregnant women living anywhere in the world – whether it’s here at home in Canada, or in regions of the world with high maternal mortality rates. The potential impact of telemedicine systems like these are endless. As for our system, we’ll finish building it this summer and pilot it in the Philippines before the end of the year. If you have a bold idea for a innovative technology or process that will help tackle a global health challenge, please check out the Grand Challenges website and take part in their next call for proposals. It may be slightly tacky to compare our team to the blooming spring flowers outside, but we certainly are growing! For the past few weeks, our in-office team has multiplied almost threefold. Who are these people, and where did they come from? Every year, iamsick.ca takes on new interns as part of the Impact Centre’s internship program. This year, we have a handful of student interns with us for the summer. A few new developers and volunteers have also joined the team. Since our group has grown so much, we took this opportunity to ask them why they decided to work with us, and where they see us going. Here’s some of what they had to say. Why did you join iamsick.ca? I joined iamsick.ca because I think it is a great opportunity to apply my technical skills while learning about the healthcare system. iamsick.ca really jumped out at me because as a marketer, I know I really have to believe in the product or service that I’m selling. And I could see the good that iamsick is going to do. What do you like about being part of the team? This is the best team I have ever worked with! Everyone is really enthusiastic and passionate about the work they do. What I really like about being part of this team is that this team is more than a team – it’s like family. How do you see yourself making a difference for iamsick.ca, the healthcare system, and the world? I look forward to helping iamsick.ca by helping to secure key deals that accelerate growth. I believe that I am working to develop the healthcare system and helping to bring advancements to the basic right of getting healthcare . We are currently looking for a Senior iOS Application Developer and a Senior Software Engineer. 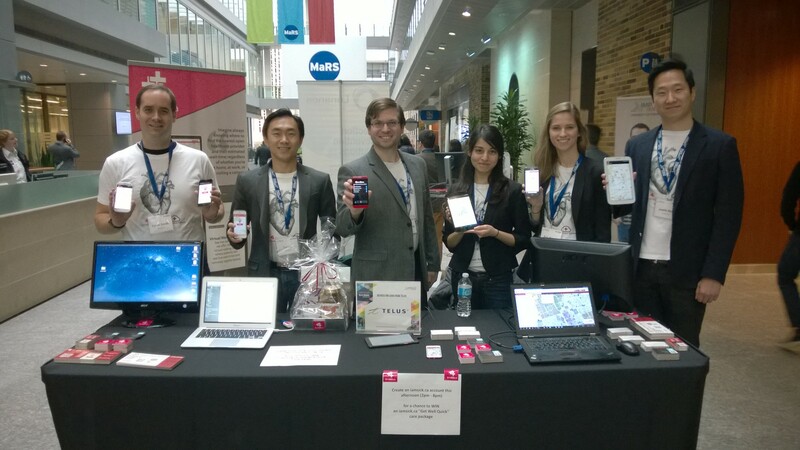 We will be at the Toronto Startup Job Fair at MaRS tomorrow, so drop by and say hi! For more information, email careers[at]iamsick.ca. We look forward to meeting you. We have left winter and planted our feet firmly into spring. With the new season comes a new round of conferences and industry events. This year, iamsick.ca will be going to six from the end of April to the beginning of June. Are you going to any? iamsick.ca will be joining 2600 of the best and brightest at Ontario Centres for Excellence’s Discovery conference next week. OCE Discovery is “Canada’s leading innovation-to-commercialization conference.” Hundreds of exhibitors will be present to showcase the latest and greatest in innovation, research and technology. Word has it that a Youtube co-founder will be there! OCE Discovery will be held at the Metro Convention Centre in downtown Toronto. Focusing on digital health, AppsForHealth is where attendees and network with leaders in the industry. Many students and professionals attend this event. This year’s two keynotes will be looking at privacy and the future of wearables. AppsForHealth will be held at Mohawk College in Hamilton. QuIPS is organized by the University of Toronto Chapter of the Institute for Healthcare Improvement Open School. The focus of this conference is to look at quality improvement and patient safety. This year’s theme is Efficiency. 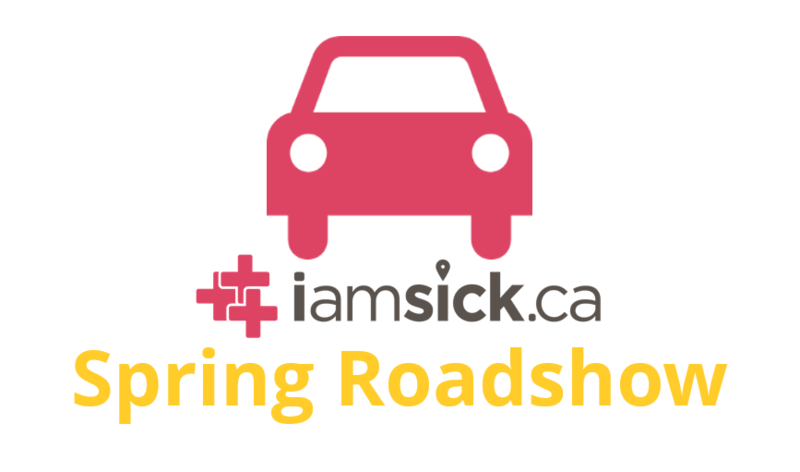 We look forward to chatting about how iamsick.ca can help improve healthcare process and efficiency and patient satisfaction. QuIPS will be held at the Li Ka Shing Institute at St. Michael’s Hospital, in downtown Toronto. An annual event, PRI-MED Primary Care Today is the largest Canadian CME/CE focusing on primary care. 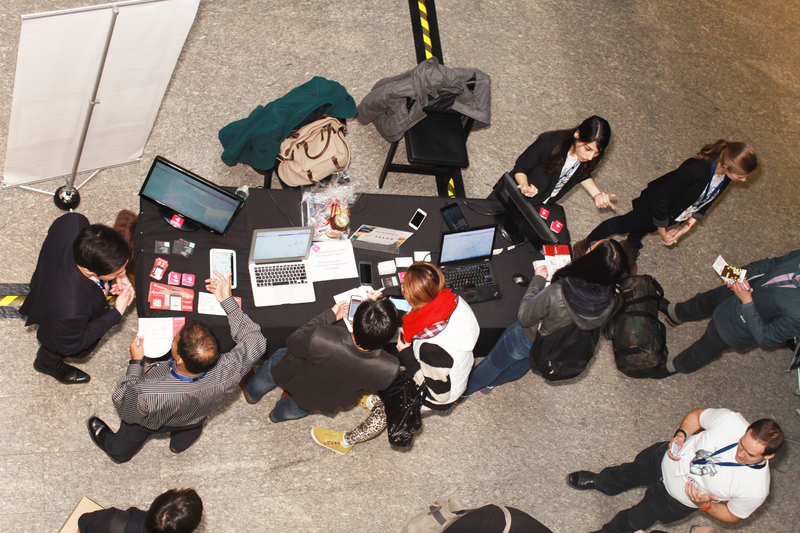 The conference includes series of workshops, keynotes and an exhibition floor. Thousands of family/general practitioners, pharmacists and nurse practitioners will be present. PRI-MD Primary Care Today will be held in Mississauga. You may have heard already that we are a finalist at this year’s HealthKick event. The invitation-only event is where we will pitch our company to investors and other industry leaders for a chance to win this year’s pitch competition. We’ve been working hard at preparing for this! HealthKick will be held at MaRS, in the Discovery District. Last but definitely not least, we will be at the e-Health Conference at the end of May. The conference will showcase the latest in e-health, and is the premiere e-health event in Canada. We will be at a booth by the hackathon. e-Health Conference will be held at the Metro Convention Centre in downtown Toronto. Are you going to any of these events? Let us down below! We hope to see you there. That’s right! 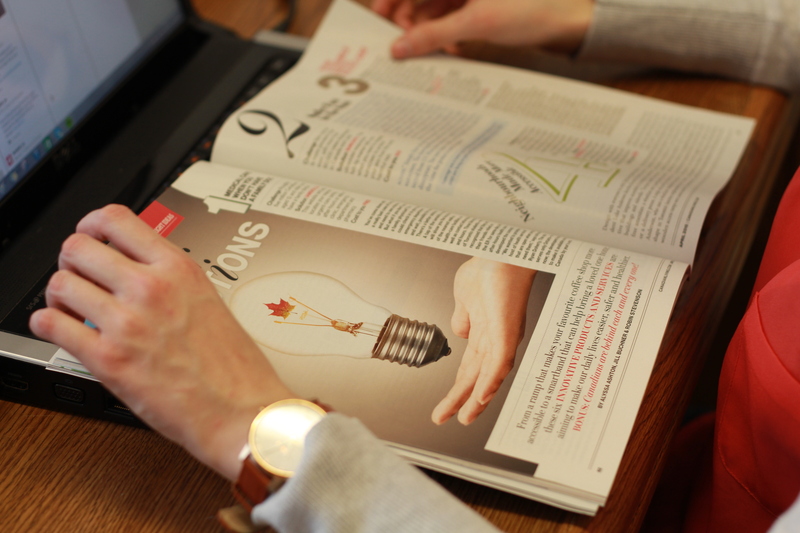 iamsick.ca is featured in this month’s issue of Canadian Living Magazine. We are incredibly honoured to be listed as an innovative Canadian solution. But we are far from the only Canadian innovation in our space. Healthcare technology is full of new and creative ideas, and the number grows every day. Events and organizations like Hacking Health help nurture these ideas into realities. iamsick.ca is very lucky to belong in such an organization. The Impact Centre, located at the University of Toronto, is an incubator that helps scientists and engineers from different disciplines transform their research into businesses. Two years ago, our co-founder Ryan took part in the Impact Centre’s Techno program. Techno is a summer bootcamp that teaches aspiring entrepreneurs the basics of business. In this program, participants learn about product development, intellectual property strategies, venture funding, and many other business topics. Successful graduates of this program will have the foundations to grow their company. iamsick.ca is just one of the many companies to have sprung from this program. MaRS is also a great resource for start-ups and ventures. As a MaRS client, iamsick.ca has benefited from their courses, services and workshops. Non-MaRS clients can also benefit from what they have to offer. The MaRS Entrepreneurs Toolkit features a library of resources, workshops and the Entrepreneurship 101 certificate program. We want to take this opportunity to thank our supporters over the years. Our many advisors, champions, and believers have helped us grow from a small idea among friends, into an ever-growing company. We also want to encourage anyone who has ever had a good idea to explore different opportunities. You never know. You may have the next big thing in your hands! What can we do to foster Canadian health innovation? Have you heard? iamsick.ca was recently accepted as a finalist at this year’s MaRS Healthkick Showcase! It is an honour to be featured alongside 38 other health ventures. For the next two months, our team will be working with mentors preparing for the pitch competition. We will be pitching iamsick.ca to investors and industry leaders, including C-suite executives, venture capitalists and senior health administrators. Now in its second year, the Healthkick showcase features early-stage healthcare ventures. These ventures are represented in three different tracks: Biotechnology and Pharmaceuticals, Health IT, and Medical Devices and Diagnostics. iamsick.ca falls under the Health IT category. This year’s theme is Patient Empowerment, which aligns with the core of iamsick.ca’s platform. Our tools were created to help patients navigate the healthcare landscape. Our platform can help provide information and tools for patients, their caregivers, and their clinicians so that they can become the partners in care. We look forward to preparing for this incredible event! Good luck to our fellow finalists. What does this mean for iamsick.ca? In December, iamsick.ca partnered with the Mississauga-Halton LHIN to help with their Holiday Hours / Emergency Department Surge strategy. Over the winter holiday, iamsick.ca collected clinic & pharmacy holiday hours throughout the region and posted it online. Doctors were also able to update their hours in real time (one doctor even updated his hours on Christmas Day!). This meant that patients looking for their their doctor’s office hours were able to easily get the most up-to-date and accurate information. At the core of this initiative are the very key objectives as defined in the Action Plan. Every year, health administrators prepare for the “holiday surge”. This is when emergency rooms across the region experience a higher than normal number of visits; which commonly coincides with the holiday season. However, it isn’t limited to just the holiday season – surges happen throughout the year. Surges not only mean that Canadians may not be getting the best access to care, it also means that a huge burden is placed on the system. With iamsick.ca, Ontarians in the Mississauga-Halton LHIN region are able to get the most accurate, relevant and up-to-date healthcare service hours through our website and smartphone apps. These benefits are helpful for patients and the healthcare system year-round, so our partnership has become a year-long partnership. You will soon hear more about how that year-long initiative will look. In addition to our LHIN partnership, we are also working on expanding our e-booking system to more clinics and pharmacies. This will ultimately help more Canadians navigate the healthcare system… and, this too supports the objectives of Ontario’s Action Plan. Everyone at iamsick.ca is a patient too. This new Action Plan means that we can expect improvements in how we interact with our care teams and community healthcare providers. It is important that everyone – you, me, our friends and family – can navigate the complexity of a healthcare system. This means iamsick.ca will always have work to do when it comes to creating and improving apps that help accomplish that. For our healthcare provider friends, we will continue to improve and expand our products to help you streamline your practice. We want to help you improve the patient experience while efficiently delivering care. If you can provide any insight on how we can do that, feel free to connect with us.